After playing catch up with mid week games through most of February and March, not only is this our last Tuesday league game of the season but with the away Northampton match on Friday we actually have the opportunity to briefly draw level on points with both Wycombe and Bury. Obviously we are a long way off from this scenario but it does illustrate how far we have come in what is still a very open league. We should have won comfortably at Cheltenham recently but our comeback on Saturday completed with a Branston injury time header does show that maybe these things do even themselves out over a season and that we as fans have to take the rough with the smooth. Cheltenham have been on the slide to mid table obscurity with only one win in eleven, (against Stockport) prior to winning away against Bury on Saturday which will probably mean they will come to Plainmoor confident of getting some sort of result. Josh Low scored twice in that victory and will be one to watch although Thomas with 18 goals is by far and away their most prolific scorer. Torquay have followed up that superb Shrewsbury win with four points from two away matches which is promotion form in this tight league. I think that Bucks has both freshened and improved the squad with Stanley and Robinson being the pick of the loanees in what has been a punishing schedule over the past two months. I would like to more or less see the same starting line up as the last home match with Murray starting and Lathrope back on the bench as I think we will score goals. Cheltenham were two up in seven minutes against Bury and with some poor Torquay defending on Saturday, that aspect of the game will need to be tightened up. Does anyone therefore think that LRT should start over Nico? Yes our last Tuesday night match of this season and I for one am happy about that as I’m not a lover these days of mid week games up at Plainmoor. I just love to get home from work on a weekday and shut the door and not go out again unless I really have to. It does mean we are getting close to the end of another season and this season is the third season the TFF has recorded thanks to your great match reports and views, what in my view is three great seasons which Paul Buckle has masterminded. The very first season just happened to be one of the most important and memorable for me, as we regained our league status that meant once again we were where we really belonged back in the football league. All the match day threads can be found here. Well worth reading again in my view. All in the order then happened with the wonderful day out at Wembley for the play-off final and our victory parade threads, sitting right at the top of the first page. Our second season (last season) was also in my view a very successful one, the most important thing we needed to do was make sure we did not end up back in the BSP again as history has shown, when we have gone up, we have come straight back down again. All our match day threads for last season can be found here and once again they are all in the order the games were played. Before the start of next season we will move all the match day threads out of the match day room to a new board that can then be found in our Torquay United Past Seasons room. Then our match day room will be empty ready to start all over again with the match day threads for next season. We do not know yet how this season is going to end, but both on the field and off it, I firmly believe we have made very good progress and the movement has been an upward one and that is a remarkable achievement, taking into consideration the times we are living in right now. Promotion is something that really would make up for our forth round FA Cup exist, but while that defeat hurt like hell, we should never lose sight of the fact we did so well to even be in the forth round, we were the only Devon club to reach that stage of the competition this season. I would love nothing more than this the TFF’s third season, to be another promotion season, what a fine record that would be for a club our size battling all the odds stacked against it. What will be will be as they say and while promotion would be the icing on the cake this season, should it not happen, I still feel we can be very proud of the progress as a club we have made since the day the club was so nearly lost forever. We have not started to well in our last two matches that were both away from home, but in both games we sure came out fighting in the second half and won one of those games and drew the other that we could have nearly won right at the death. In our last home match we did start very well and got an early goal and then pushed on looking for more goals and boy did they come. It was the sort of game and display from the players that make fans want to come back for more and therefore I believe our gate will be better for a Tuesday night game than the last few have been..
After starting young Murray in the game just after he came here, it does seem Bucks might have a few doubts about what he can offer the team and it may be the case he will only be on the bench for this match. I’m sure he does have a role to play in the team, but maybe if Billy Kee is fit, he would be the best one to play up front with Tomlin. Rob asks Nico or LRT? As we do not seem to be using Nico’s long throw-ins and he is not taking all the corners, I might go with LRT. He has shown he is slightly better in defence and it does seem he got forward well in the Macclesfield game. The key to winning this game is the same one for all our recent games, keep the ball on the floor and pass it. Its no good just lumping it up high to our forwards, we seldom win the ball and we end up giving the ball away. We have players who are good at passing, players who have pace to burn and on our day, we can out pass any team in this league. We do need to be at the races from the very first whistle and get at them from the very start, we have plenty of goals in us now and I can see us going in at half time one or two goals up. If that happens then we need more of the same in the second half and not end up sitting deep as we have done in some recent home games where we found ourselves in front. Lovely sunny day up in north devon this morning and very clear signs from the magpies at magpie valley that its going to be a good win for us tonight. Three one is looking the most likely score. Lovely sunny day in South Devon too. Although a midweek game I hope that the crowd gets into the 2000's as no games on tv of any note and no two games in a week to pay for. Unlike our turnout at Cheltenham they will only bring about 100 seeing its midweek. The men in white coats are right behind you Dave! Just driving round the Bay with mum and dad this lunchtime reminded me how beautiful the place can be when the sun shines. Such a shame the shopping areas (Paignton and Torquay) really are such (and I take no pride in saying it) cr*pholes. 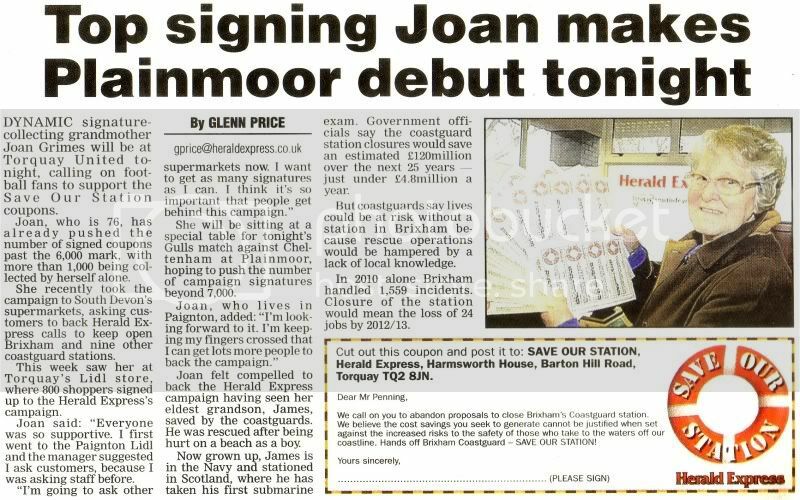 Make sure you look out for Joan at tonight's game to try and help save our coastguard station. on a slightly different note, has any of you driven home along the sea front after our last two Saturday matches. If you did then I'm sure you would have noticed a very strange man with long white hair and beard holding a large stick, sitting on a chair on the seaward side path at Livermead. He just waves to every single car and I was wondering if anyone knew who he was. The Bay still has much of its natural beauty and the reason why we need a good number of nimbies to ensure it does not get concreted over for the sake of it. Out of town shopping, high car park charges and over zealous wardens have all taken their toll on the town shopping centres, but sadly its the same story in nearly every town centre these days. The first evening game for ages where I haven't been running late and can be confident of getting in before kick off and indeed hopefully in time for a quick beer in the Gulls Nest. Am very optimistic about tonight and having missed the last two home games due to being away in France am looking forward to seeing the new players. The first time I saw Cheltenham at Plainmoor Robin Stubbs scored six on his own so I do not envisage too many problems! Don't want to much then Stefano ;D I will be happy to take a one nil win tonight, its all about staying in a play-off place and getting closer to an automatic promotion place. I'm hoping for a good performance from the team and an enjoyable match on the eye. Right just about to head over to Plainmoor with boy wonder, I hope all those listening to the match on the radio and gulls player have no problems tonight. The third best thing to being at the game, has to be listening to it on the radio and its maddening when the bloody thing does not work as it should. Positive frame of mind...we've got no bloody chance Simon!! !